The progressive let-off construction allows easy adjustments for draw weight, making this bow fast and reliable. Its components are made in the US, and high-quality materials are used to guarantee its sturdiness for years. Priced more conveniently than other models on the market, it is the right option for beginners who don’t want to spend a lot of money on their first compound bow. No arrow rest and nock are included with your purchase. Some users say that it is much more suitable for target practice, and hunting small game at best, thus its uses may be somewhat limited, at least as hunting is concerned. Are you looking for a compound bow that is versatile and easy to use? Look no further than the Gen-X Bow – RH/LH. Ideal both for shooting at the range for fun and increasing accuracy, as well as for hunting small game, it is the kind of bow that can be offered as a gift to someone who takes up archery and needs a proper weapon to train. Because you can choose from the version for right-hand shooters and the one for left-hand shooters, you will notice from the start the attention of the company making this bow for its customers. Versatile and adjustable, this bow is also decently priced, and many customers comment on the advantage of purchasing such a sleek, comfortable-to-use, compound bow for a price lower than expected. First things first, it must be said that this bow is made in the US, thus abiding by the highest manufacturing standards. 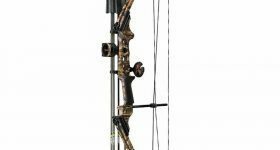 The materials used, as well as the craftsmanship invested in this model, will tell you right away that this is a sturdy compound bow that will last for many years. Should you decide that archery is for you, this model is a sound investment, as it is sturdy and it will withstand a lot of usage over the years. You might expect a bow made from lightweight materials such as aluminum, to be anything but robust, but that is where the innovative techniques used by the manufacturer come into play. The machined aluminum riser, as well as the aluminum cam and the idler wheel, keep the weight of the bow to a minimum, and they are well balanced by composite limbs. The bowstrings are designed for high strength so they can send your arrows at a distance with excellent accuracy. Weighing only 3.4 pounds, this lightweight compound bow is a must for beginners. Versatility dictates the value of this bow, and from a simple look at its design, you will be able to tell that it fits a large variety of shooters. The standard draw weight for this bow is 40 lbs, which means that you will be able to send your arrows at high velocity toward the target of your choosing. However, the draw weight can be adjusted down to 25 lbs, allowing shooters of all levels and strengths to use it without a problem. You will need a 3/16” hex wrench to work on adjusting the draw weight, but the tool needed is readily provided by the manufacturer, which is another great plus. Another aspect that shows how much this bow caters to a large category of shooters is the draw length that can be adjusted between 21” and 30”. A wide variety of colors and camo options are available, so you can pick one that reflects your personality and style. The single cam design of the Gen-X Bow – RH/LH helps the shooter achieve the desired velocity, as its draw weight goes as high as 40 lbs. The smooth draw circle makes things easy for shooters, providing them with the means to increase their accuracy and the velocity of their shots without a glitch. 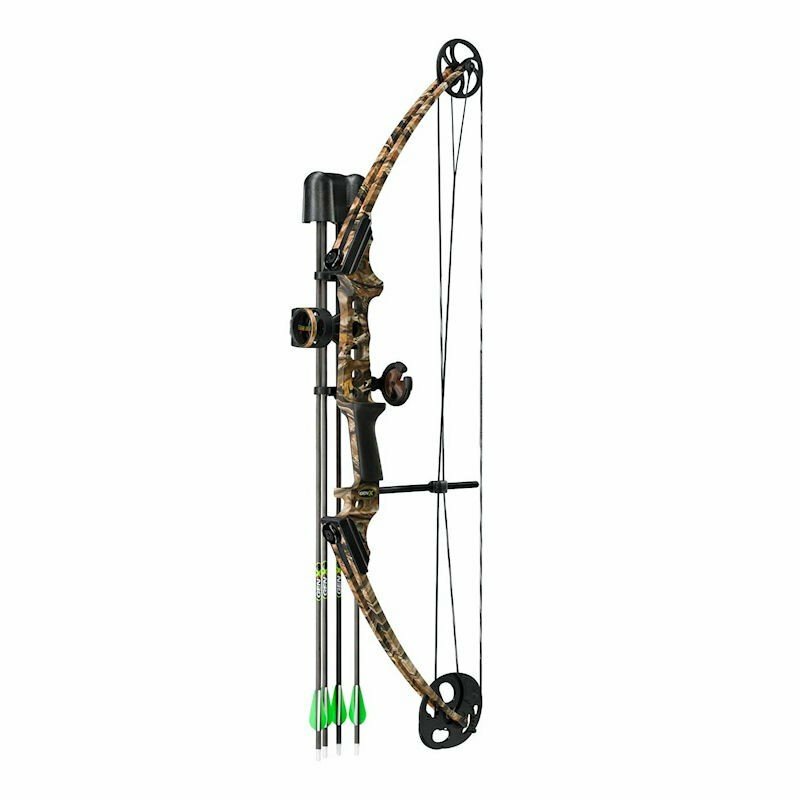 The 35 ½” axle-to-axle construction ensures that this bow offers perfect stability, something that matters for beginners that do not always manage to adjust their aim with ease. The molded grip ensures that you will find the bow comfortable to use, while the machined aluminum riser comes pre-drilled and tapped to make it easy for you to attach accessories. Anyone who has tried this compound bow can tell you that it is a good option for hunting, but mostly if you are after small game. Actually, it is legal in most of the US for hunting whitetail deer, which says something about its capabilities and uses. Because it is lightweight, you can use it from a tree stand, without straining your hands. Also, if you like target practice, this bow is an excellent companion and tool for honing your skills. In case you’re not at all interested in hunting, you will find the bow reviewed here to be just what you need. A bow that can be used successfully for target practice and hunting small game, the Gen-X Bow – RH/LH is an excellent choice for a beginner. Because its draw weight and lengths can be adjusted, it is a sound investment, too, as it will grow with the shooter and his or her abilities. The smooth action of this bow recommends it for those who need a forgiving weapon that is also comfortable to use. Lightweight and convenient, it is also decently priced, so a good alternative for anyone who wants to take up archery.